Data Entry jobs are really great for people who want to work from home but not much qualified. Whether you are a housewife, a student, a retired person or just someone looking for extra income then data entry is best for you. You just need good typing speed (minimum 25 WPM), able to read basic English and a PC with internet connection to start data entry jobs. Data entry jobs are very diverse and a data entry worker needs to specialize in one given domain. Let us see different kinds of data entry jobs one by one. You can work on any data entry job depending upon your skills and time. You have to read from a PDF document and write it into a Word document. 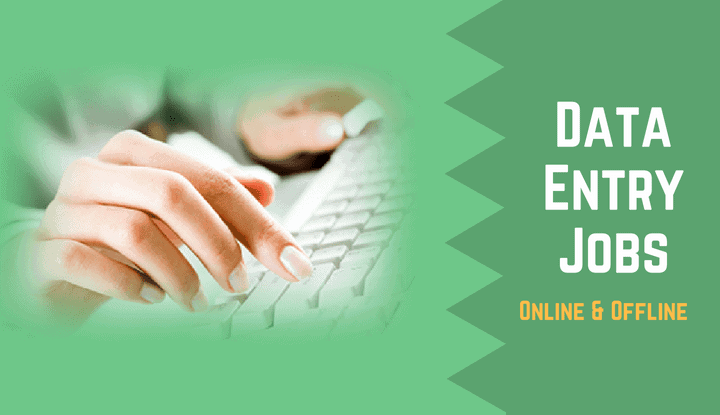 You can get paid Rs 20 to Rs 50 per page in this type of data entry job. The job is very simple and not technical at all. You can get paid Rs 100 to Rs 150 per hour depending upon the speed and accuracy. For regular data entry jobs you get paid according to your experience and accuracy. Just check this post to find these types of data entry jobs. Next articleHow Much is the Cost of Education in India? I am looking for a legitimate (no upfront fees) work from home position. I am an excellent typist and data entry person. I have excellent knowledge of the English language and am proficient in proofreading. Please send any legitimate typing, data entry, or proofreading jobs to me for evaluation and application. Thank you! I am interested in data entry or similar jobs. I have Very Good Typing Speed. Now I am jobless since 3 year,I have financial crises, I have laptop,printer, scanner, So I am interested to work above mention job and earn money from home without any investment but will have tough time to run activities beyond my own family such as helping others in running their families, some social activities, etc. Kindly provide me link of organizations looking for worker like me. Sir I am zakir ahmad malik sir I have a diploma in computer…. Data entry, DCA… Diploma in computer applications… Sir snd me PDF and I will type in Ms word…. Its good you are giving so much valuable information. Why don’t you mentioned some legitimate Data Entry work from Home Provider, this would be very much appreciated by persons like me, who are looking to earn some income to make their Ends Meet. Hope you will consider my Humble Request. My name is ajay. I Have just finished my 12th and searching for a job to my college fees and to support my family financially.I believe Surejob website could help me. Dear Sir my name is Ankit Kumar. I am working in Administrative depart of Indian Postal Services. I am having a working experience of 10 years. Please provide me Plain data enty job. Job must be free of registration. Ifound sure jobs very helpful in finding.,processsing jobs.I would like to join for data entry job..plese send me email about the same..siddique ahmad. Can you please help me to start with this job. I will be eagerly waiting for your help. I Have just finished my 12th and searching for a job to my college fees and to support my family financially.I believe Surejob website could help me. Sir I m very interested in home based data entry work…. I need a home based job.. I have laptop at home and wifi connection also. I can work freely. I have very low financial status which is not sufficient for my family and for the further studies of children. I hope surejob.com can help. hello. Fiverr and Upwork became known so there is a lot of competition. I am new so how could I gain a gig. I write but I wanna be a copy writer. I am interested in data entry or similar jobs. I have more than 30 years of experience in typing jobs. I am about to retire but will have tough time to run activities beyond my own family such as helping others in running their families, some social activities, etc. Kindly provide me link of organizations looking for worker like me. I have already completed only free jobs 1) form filling 2) copy paste job @ 10+10 data entry /day in two free job sites, but finally, they asked me to wait for 10 days after completion of my paid jobs. It is now more than 10 days they have not replied anything but on the site, certain mistakes were given and underscored by the red line, cannot be corrected. I think this site is for their income through advertisements only. For which they have given the terms for 30 days with 98% accuracy. I think this is a fake site only. I trust SureJob. Now I request you to recommend secured and genuine 100% free site for the above jobs. I am having 60 w.p.m. typing speed and I am having more than 20 years experience in the data entry work. Hai I am interested part time data entry jobs. I am a degree holder and 5year experience in receptionist at hospital. So if you give me jobs I am very very thanks to you. hello, I’m from Bangladesh and trying to work .please instructed me for next step . i want to be part of the data entry job, seriously. I have observed that you are credible to deal with. This is key in such an engagement. i found sure job very fantastic as they are’nt fake and do not charges any ragestarationfee ,iwish to join it very soon.. I am working in private sector as accountant Please provide me full detail online form filling jobs and offline data entry jobs.i can do it . Iam interested in this job.Especially data typing job.Iam compleated Data entry operating course under the ASAP .I want data entry job from home.I have laptop with net work connection. 2. Other Basic Typing Jobs: Other basic typing jobs can be working with Excel Spreadsheet. Here you just have to fill cells with data. You really do not require to know about formulas and other technical stuff. The job is very simple and not technical at all. i love to take a part in this. Thanks for providing these types of home based job and I am interested to do online data entry , please give me further information to joining this job.. I am a VRS opted person, having working experience in two corporate companies. I have very good accurate english typing speed. Need a job full time for simple data entry job in kolkata urgently. i’m Saheb Rahman from India,West Bengal.Now i working under CA firm “Agarwal Nyoliwala Dalmia & Co. I know under this working:All type entry in Tally ERP9 (Like Slaes Bill,purchase Bill, BRS & etc. ), ITR,VAT,Internal Audit & etc.Now i looking a part time accountant job.i read your job information so i interested in your data entry work. if you send me a mail of your data entry process. i will contact you soon. I want Plain Data Entry Jobs from home. I am interested part time data entry jobs. I am a degree holder and 1year experience in it field. So if you give me jobs I am very very thanks to you. Thnx for providing these types of home based job and I am interested to do regular data entry jobs plz give me further information to joining this job..Thanking you.. I am post graduate but I am unemployed. I have degree of computer course. please help me for data entry jobs. I’m Prinson as I’m interested with this data entry job …..and I have all needed things for the data entry…so I kindly request you to make me as a member of your company…..
Hi dear sir,madam, I’m Lakmal from sri Lanka. I like to doing part time job as data entry from home. But need to know about trusted sites would be can do it,pls can you send further details for me? Other Basic Typing Jobs: Other basic typing jobs can be working with Excel Spreadsheet. Here you just have to fill cells with data. You really do not require to know about formulas and other technical stuff. Hello.! My Name Is Daniyal’ And I Want (Plain Data Entry) Job. So Please Tell Me That How Can I Do This Job.